dispersed effectively, leading to a loss in stopping power. 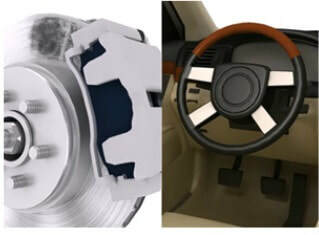 steering wheel to shake and the brake pedal to vibrate. 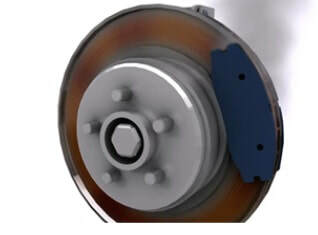 Brakes are designed to convert movement energy into heat in order to slow and stop your vehicle. Worn pads or foreign objects can cause damage to the disc surface. Installing new pads on grooved discs can result in accelerated pad wear and increased squealing from the brakes. The friction of the brake pad against the disc eventually causes the disc to become thin. Efficient braking requires the disc to dissipate the heat generated as quickly as possible. With a thin disc, the heat is unable to escape quickly enough from the surface, causing brakes to overheat and lose stopping power Under certain circumstances, such as extreme braking followed by prolonged pressure between the brake pad and hot disc, some of the friction material from the pad can become embedded into the surface of the disc. This causes the disc to have uneven thickness. The warped effect on the disc can cause the steering wheel to shake and the brake pedal to pulse - especially under heavy braking.